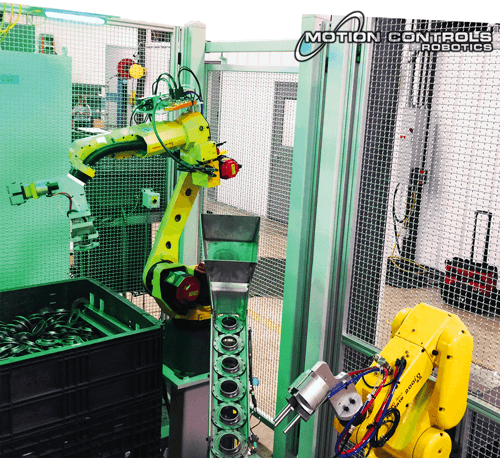 Robotic random bin picking is a process used for machine loading and/or separating parts from a bin for production purposes. This process is commonly seen in industries dealing with automotive stampings, molded plastics, or medical assemblies. 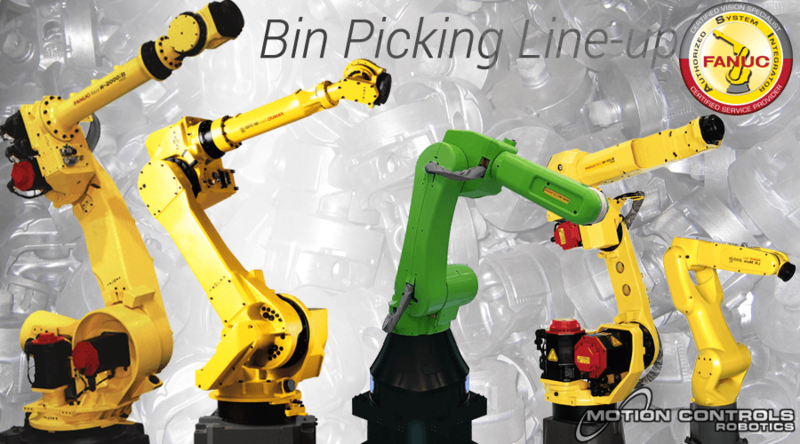 When deciding on developing a robotic bin picking cell, the part to be picked has to be analyzed based on its shape, material and size. Then the cycle time for picking and placing these parts needs to be considered. Typically the rate for picking parts from a bin ranges from 6-15 parts per minute. Bins containing randomly placed parts can be large wire containers, a small to large plastic tote, or even a tray. Click on the robot to read more about the robots that are commonly used for bin picking applications. Having robots reach into bins to remove heavy parts helps eliminate repetitive motion and reduces injuries to employees. In the above image you can see some parts are placed randomly in the bin while some are organized either with or without dividers. Structured bin picking has parts in specific locations, ordered. This type of bin picking is typically simpler and less expensive to execute at the unload end of the manufacturing operation. 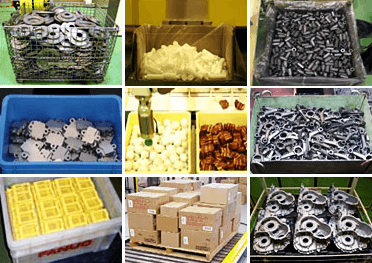 Random bin picking satisfies ultimate material handling objectives; bulk fill containers with parts coming directly off of manufacturing cell. Transport bin to downstream operation, set the bin in place, and automated manufacturing can resume.